The correct answer will always be personal to each patient. Your decision should be based on multiple factors including your history (how long your problem has gone on for), your symptoms, the physical findings on examination and your test results. You should also be taking into consideration your response to any previous treatments and your personal goals. Your decision should be a choice made after careful consideration and informed discussion between you and your specialist. Sometimes it is a quick decision and very obvious, other times there is a lot to consider and it becomes very difficult to decide. With this in mind, we have attached some links to information you may find useful below. A physiotherapists role is to look at postural correction/re-education and maladaptive movement patterns. A patient's spine requires support from the adjacent musculature and these muscles have the fire at the correct time; therefore work is focused on both the patient completing a personalised home exercise plan and one-to-one sessions with a physiotherapist in a gym. The therapist will also provide information on modification of activities of daily living and how to manage these pain free." This is a common surgical procedure performed under general anaesthetic and is used to treat damaged discs in the neck through a small incision just to the right of the adams apple. An xray machine is used to check the correct position and the muscles on the side of the neck are parted so the front of the spine is identified and exposed. The xray machine will again be used to double check the correct position. Special retractors are used to hold the tissue safely aside, these tissues include the larynx (wind pipe), the oesophagus (swallowing tube), carotid artery and jugular vein. Another special instrument is then used to hold the vertebral bones apart and create space to work in. If your operation is being performed by a Neurosurgeon, a microscope will be brought in bringing lots more light and magnification to allow precision in operating and renders the operation much safer than without. Gradually the back of the disc and any osteophytes causing problems will be cleared to expose the central canal. This will gradually relieve the pressure on the spinal cord. A specifically designed high speed air drill is used at this point to carefully drill away any compressing bone, also known as osteophytes: bony spurs resulting from degeneration of the disc. The tunnel through which the nerves exit the spine on either side are now cleared of any obstruction. This is called nerve root decompression. The removal of the disc itself is called a discectomy. Once the decompression of the spinal cord and nerve root is complete, the bone collected from decompression is packed into a cage and placed into the empty disc space. This realigns the spine and stabilises it. If necessary a drain is inserted and the wound is closed. You will then be gently woken up from the anaesthetic. Once you are back on the ward you will be allowed to sit up and you can eat and drink. You will be mobilised whilst wearing a soft collar and you can go home the day after surgery. This operation usually significantly improves any arm pain or weakness. This procedure is carried out to take the pressure off the nerve root in the lumbar spine which causes sciatica (leg pain). It stops deterioration of symptoms such as weakness, numbness and tingling in the leg(s) affected. This procedure is also carried out under general anaesthetic and you are positioned on your front on a specially made mattress (Montreal Mattress). The level of the operation will be determined using an xray machine and a small incision will be made in the middle of your back. The muscle is pulled on one side of the incision and held away with special retractors to allow for access. A microscope will be brought in at this stage and your surgeon will partly drill away the bone to form a small opening in order to identify the compressed nerve underneath. The nerve will be released from any underlying disc fragment pressing on it and the fragment will be removed to prevent any future nerve damage. Any other loose fragments of bone will be removed to reduce the chances of the disc recurring. The wound will then be closed and you will be woken up. Once you are back on the ward, you are allowed to position yourself as comfortable in bed and you can mobilise with the help of staff. You will usually be allowed home the day after surgery. This operation usually significantly improves leg pain and prevents any further neurological deterioration and will allow your damaged nerve(s) to regain function. You will notice your strength improve and any abnormal sensations such as tingling, will improve. You will have discussions as to whether you are a suitable candidate for disc replacement. Such patients usually have otherwise healthy looking and functioning discs but have a small portion of it protruding into the spinal canal thereby causing compression. This means that, had it not been for the rupture of the disc, that particular segment was otherwise healthy and has normal facet joint function and movement at that level. Patients with osteophyte formation, arthritis in the facet joints, stiffness or lack of mobility will not generally be suitable for disc replacement. This procedure is identical to the anterior cervical discectomy except that instead of a cage filled with bone being inserted at the end, a disc replacement is inserted to maintain movement of the disc. The main aim of the disc replacement is to prevent adjacent level disease however disc replacements do come with their own complications. As your own natural discs do not last forever, neither do the replacements and for this you may need revision surgery. 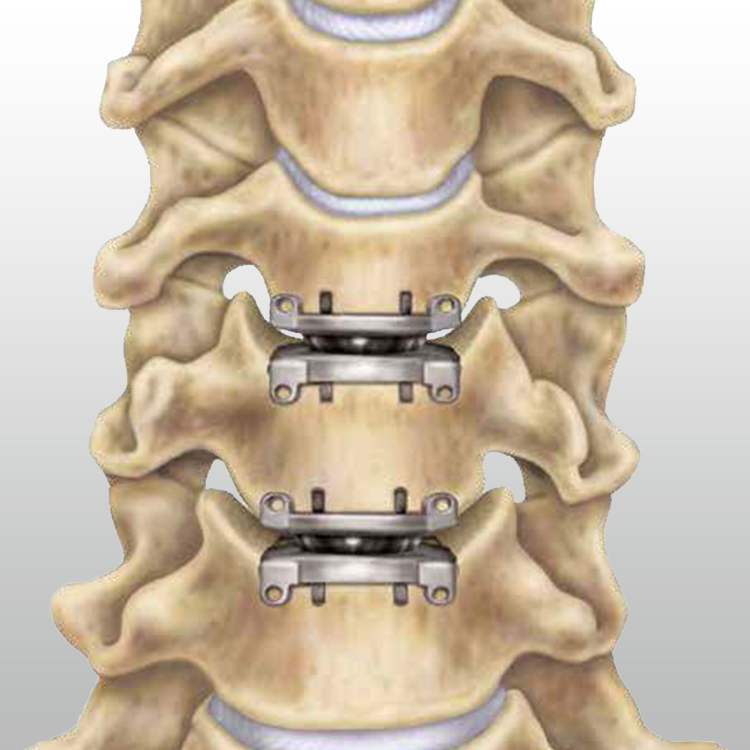 Disc replacements can also still fuse thereby hindering movement at that level. Other risks to the replacement include metal debris and excessive bone formation around the replacement (heterotopic ossification). Arachnoid cysts are benign cysts containing cerebrospinal fluid (CSF for short) which can cause pressure on the spinal cord resulting in neurological symptoms of loss of balance and weakness in the lower limbs. They can also interfere with the function of the bowel or bladder and can cause pain and change of sensation in the legs and feet. MRI scans or CT myelography may be used in correlation with physical examination to diagnose these cysts. Once a diagnosis has been obtained, if neurological symptoms persist or become progressively worse, it is prudent to then consider an operation to remove these cysts to prevent any worsening of symptoms allowing your spinal cord to recover its functions and prevent future deterioration. This operation is performed with a laminectomy and by opening the dura (the sac around the spinal cord) to find the arachnoid cyst seen using intraoperative scanning to mark the correct level of the location of the cyst. A microscope will then be used to visualise the cyst to then remove it to re-establish flow of CSF and to take the pressure off the spinal cord. Spinal cord tumours are tumours which occur within the substance of the spinal cord. The majority of these tumours are benign. However, they cause disruption to the normal functioning of the spinal cord as they grow they occupy the spinal cord causing pressure. When they are small and tolerated by the spinal cord and provided they do not cause any symptoms such as pain, progressive loss of function, tingling, weakness or pins and needles, the management is usually conservative and involves clinical and radiological surveillance. Once they start causing neurological symptoms and signs as above which progressively or suddenly worsen, then following radiological confirmation of growth or occasional bleeding, surgery is advised. In order to operate on this type of tumour a laminectomy is performed for your surgeon to access the spinal cord. Using a microscope, the sac around the spinal cord and the nerves (the Dura) is opened. Depending on the type of tumour, it is possible to either remove the tumour completely or biopsy and remove the bulk of the tumour. The exact detail of such decisions is made at the time of the operation. Scans alone can never determine the exact nature of any tumour and in order to ascertain this information, the tumour must either be removed or biopsied for examination in the lab by a neuropathologist. These operations are very difficult to put into 'brackets' as details and actions are always tailored to each specific case and will be discussed between you and your surgeon at the time of your consultation. In this operation, part of one or more vertebra along with the discs above and below that section are removed to take the pressure off the spinal cord and the affected nerve root(s). This operation is usually chosen in conditions where there is more extensive pressure on the spinal cord or nerve roots as opposed to isolated pressure due to limited disc protrusion or bony spur formation. The part of the disc and the bony vertebra removed is then replaced with a bone graft from your iliac crest (the bone above your hip joint) and requires stabilisation with a metal plate and screws. 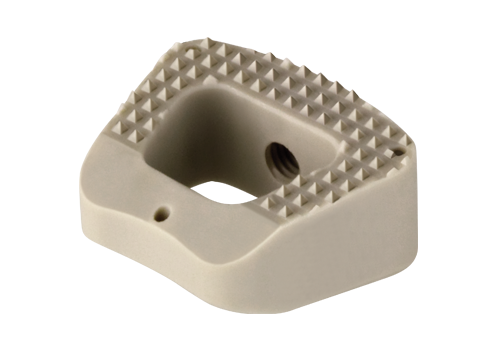 It is sometimes possible to use expandable metal cages instead of bone graft. This operation is carried out under a microscope and all aspects of it are similar to an anterior cervical discectomy except on a larger scale. This operation also carries the same risks as an anterior cervical discectomy and fusion. A laminectomy is an operation where bone at the back of the spine, along with part of the ligaments, is removed in order to access the spinal canal. This is usually performed to access tumours affecting the spinal cord or nerve roots or to remove the pressure from the spinal cord/nerve roots. This operation requires you to be positioned on your front on a special mattress (Montreal Mattress). If the laminectomy is in your neck, you will also have your head placed in a special clamp (Mayfield Clamp) The level of the operation is determined using xrays and an incision is made in the middle of your neck or back. Your muscle is retracted from the spinous processes and laminae (the bones that make up the back of your spine). The microscope is then brought in and using a drill and other instruments, the bone and underlying ligaments (which can be abnormally thickened) are removed. As a results the spinal canal is opened and in cases of spinal canal narrowing, the pressure is removed from the affected spinal cord and/or nerve roots. The bleeding is then controlled and if necessary a drain will be inserted to remove any residue. After the operation you are allowed to mobilise with the help of nurses/physiotherapist once your pain is under control. If the operation is carried out in your neck, you may benefit from a soft collar for a short period of time. You will be allowed home 48-72 hours after the operation.